Timed to the upcoming release of The Divergent Series: Insurgent, the sequel to the 2014 blockbuster Divergent, Barbie(R) unveils images of the new Tris Barbie(R) doll available now on TheBarbieCollection.com and Amazon.com. In this photo, the Tris Barbie(R) doll reenacts an iconic scene from the new movie in theaters nationwide March 20th. 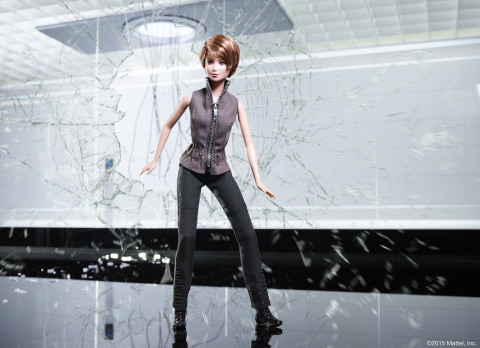 El Segundo, Calif. (March 6, 2015) – Timed to the upcoming release of The Divergent Series: Insurgent, the sequel to the 2014 blockbuster Divergent, Barbie(R) unveils images of the new Tris Barbie(R) doll available now on TheBarbieCollection.com and Amazon.com. In this photo, the Tris Barbie(R) doll reenacts an iconic scene from the new movie in theaters nationwide March 20th. Barbie and associated trademarks and trade dress are owned by Mattel. (c)2015 Mattel. TM & (R) Summit Entertainment LLC. All Rights Reserved. Barbie and associated trademarks and trade dress are owned by Mattel. (c)2015 Mattel. TM & (R) Summit Entertainment LLC. All Rights Reserved.